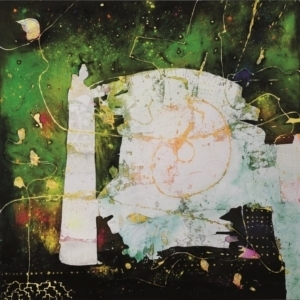 Gesine ARPS’ paintings tell a positive story, which speaks to the beholder’s intuition. The free-flowing curves seem to jump out of the canvas and surround us with its energy, drawing us into the story. The bright colors remind us of the Italian sun where the artist lives. Mankind, animal-kind, nature: she extols the harmony of living as one. The plants grow straight aiming high, people look up at them solemnly. An aquatic creature with fins and a human face goes into water, the origin of life. A human body twisted like a snake reminds us of a yoga pose. Is the figure that resembles a big tree waiting for a supernatural revelation, or on inner enlightenment, or is he in awe of nature? Ladders to transcend dimensions, a lotus flowering out of the darkness, horses, numbers, towers… Gesine ARPS’ world is full of seemingly random elements, but they are not independent entities. Each of them creates a story with reciprocal relationships and continuity. And we human beings are only one of those elements. In these symbolic representations of Gesine ARPS, we can firmly grasp the influence of the East Asian concept of Tao and nature worship, along with inspiration from myths, Western philosophy, art history, Tarot, Kabbalah etc. Gesine ARPS’ introspection through the act of painting probably allows her to connect her inner-self to the universe as she does in her daily yoga and meditation. Taking the symbols on to the canvas, she visualise the balance of the world as she wishes. In The Art of Happiness by Tibetan Buddhist Dalai Lama the 14th, a figure greatly revered by Gesine ARPS, he preaches the necessity of exploring spirituality beyond religion. Her works are full of this message. In contrast to the Western painting approach, which developed Realism by measuring the positional relationship between a person and an object from a specific viewpoint (that is, the distance between the human and the outside world), the expression of Gesine ARPS by lines, planes and dynamic composition without Chiaroscuro or perspective evokes a Japanese sensibility in which birds, fish, people’s movements and facial expressions are developed in front of the eyes, ignoring the distance between the viewpoint and the object. In the depths of her bustling canvas, there is a holy peace. That might be because of her extremely skilled work processes, superimposing different mediums: acrylic, oil, pigment and sometimes wooden parts or plastics on the gold- or silver-leaf repeatedly applied on the first base of the canvas, as inspired by the Italian Renaissance paintings of which the artist has been strongly impressed. 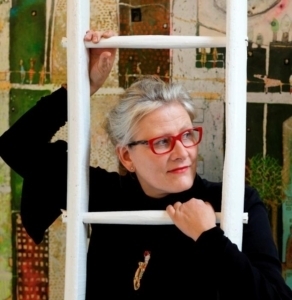 The real pleasure in Gesine ARPS’ art work is that, based on deep spirituality and precise techniques, her creations always emanate a pleasant, child-like lightness. Each time we appreciate her work in front of us, its novel shine fills our hearts with joy.